haven’t seen this picture before. Great picture and lovely shot of you, Catherine. Cool site… We enjoyed looking at all the different spider images and learning more about them! Your Salticidae with the red spot on the body looks like being a Corythalia sp. and most probably Corythalia opima. I recently caught a female western black widow in Utah. It has red spots in a vertical line going down her back. Is this common? I caught one a few weeks ago that did not have these red markings on the back. this is the first time I have seen red on the back of a widow. Western black widows are extremely variable in colouration – some adult females retain the “juvenile” colouration you’re referring to, others are pure black with no hourglass, hourglass shape can vary a lot, etc. So yes, fairly common – but you may see other variations as well! Hey there. I love your Blog- need a week to read it! But I have a question . I live in sub-tropical Hong Kong and we get some great spiders. The most spectacular is a Golden (?) Orb spider which grow to be as big as your hand and they build huge webs. I want to know if you know if they can be handled? Are they likely to bite? I really want to handle one- just want to check! Thank you so much for your kind feedback, Derek! Spiders in the genus Nephila are beautiful! I hesitate to recommend handling any spider because there is always a risk of injuring the spider and (usually less likely) of injury to the person doing the handling. But to answer your question, no Nephila are not aggressive and there are several videos of people handling them online (here’s an example: https://www.youtube.com/watch?v=xhS4us-ns6o). If the spider is walking around on your hands, you are just a substrate and there is no reason for it to bite defensively. Please be careful and respectful of the spiders you find, and enjoy them! Do you have any idea what kind of spider makes a cottony web on the ground? I live in Surrey,Bc Canada we seem to have an infestation of them… The brown spider sits in the earth and awaits its moment. I saw one hauling a wasp into the ground in the early evening last night. I have a couple of nasty spider bites so I am trying to identify them for the Dr.
Can you send me a photograph of one of the webs/spiders? This blog is not allowing me to attach photos, but I do have a couple if there is another way to send them to you? Hi, we live at altitude of 390m. in the Philippines. We have a creature living on one of our fruit trees that looks like a spider but apparently has ten legs. Just wondering if you might be able to identify it. The 9th and 10th “legs” are actually the spider’s incredibly elongated spinnerets! Thanks so much for sharing those lovely photos! And now I know! Thank-you very much. We have a lot of photogenic spiders in our yard. There is also a part of my blog called Collections where I have a page dedicated to my best spider shots. Hello Catherine! I met you in the spring at Island View Beach with Dr. Blundon and my Environmental Technology class. I just stumbled upon your blog when I was looking up a spider I found (Araneus gemma!) I just wanted to say, thanks for taking the time to meet with my class. 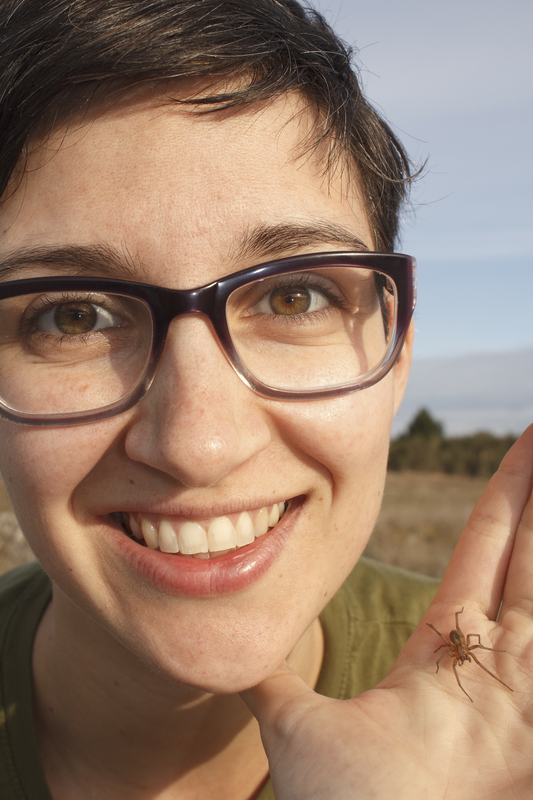 I had a really great time learning about spiders, and since that day my arachnaphobia has nearly disappeared. It was a huge turning point in my life (haha). Keep up the good work. Hi Catherine, I was just wondering if any of my spider / bug shots would fit within your PhD? If they would they are yours to use for free. I caught this spider in my house yesterday. I always assume they are Florida wolf spider because it makes me feel better I guess. I made the mistake of only taking the underside of her as a picture and that makes it hard to convince me that it is a Florida wolf spider now. If I can email you the picture, do you think you would have any idea? Thank you for all the wonderful info you’re giving us. Absolutely, please send me the photo in an email and I will do my best to identify the spider! I am on the Olympic Peninsula in WA State, right across the Salish Sea from Vancouver Island, in a heavy forested setting at about 600 ft elevation. Any ideas? I did take a bunch of pictures if you would like to see one. Sounds like it might be a crab spider but please send me a photo at catherine.elizabeth.scott@gmail.ca and I can let you know with more certainty! I found you in an article with KQED. I am amazed by all your work. I have a beautiful female black widow right outside my window. Up in the corner of the brick on the building. She seems quite large to me. Her web is amazing! There is a smaller brown spider in her web this afternoon. I am curious if it could be a male, who just didn’t send the right messsages to her! Or if she was hungry after the mating ritual! I do have photos of both. I am truly enjoying her.